Congresswoman, civil rights activist, social reformer, and educator, Shirley Chisholm broke down racial and gender barriers in the 1960s and 1970s. She made history not only as the first black Congresswoman but also as the first black woman to seek a major party’s presidential nomination. Born on November 30, 1924 in Brooklyn, New York, Shirley Anita St. Hill Chisholm was the child of Barbadian immigrants. Growing up as one of eight kids during the Depression, Shirley understood the meaning of hard work and saw education as a means to secure her future. After receiving a Master’s Degree in early childhood education in 1951, she began her distinguished career as an educator. Beyond teaching, Shirley became involved in the Democratic Party, becoming active in both the League of Women Voters and the Seventeenth Assembly District Democratic Club. In 1964, Chisholm was elected to New York’s State Assembly where she served until 1968 when she decided to run for Congress. Shirley’s campaign slogan was “Unbought and Unbossed,” which summed up her approach to her job quite succinctly. When she first went to Washington, Chisholm was relegated to the Agriculture Committee, which she pointed out was irrelevant to an urban district such as her own. She was asked to “be a good soldier” and just accept the assignment, but Chisholm instead sought out the chairman of the House Ways and Means Committee, who made those decisions, and delivered a parliamentary salvo. Before long, Shirley was reassigned to the Veterans Affairs Committee, and later the Education and Labor Committees. In 1972, Chisholm decided to take a stab at winning the Democratic nomination for president. She was frustrated that so many viewed her candidacy as merely symbolic. You see, Shirley was not running so she could be “first” or to get a little extra publicity, she was seeking office as a serious candidate. 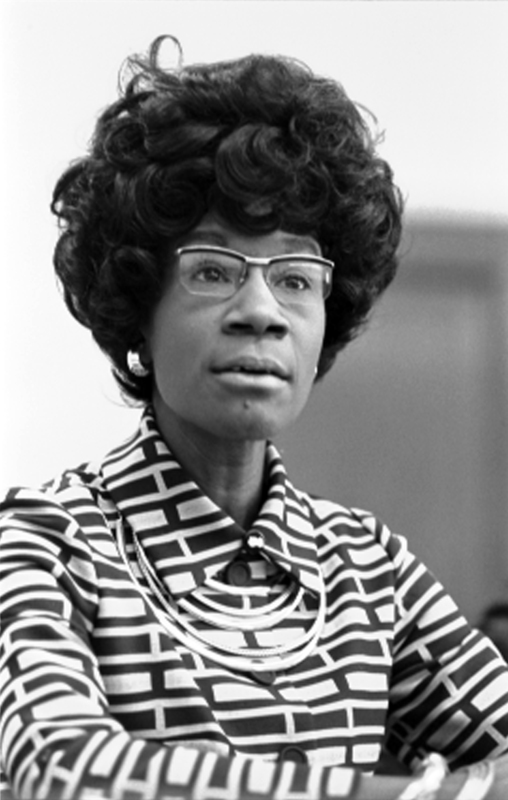 Chisholm was voted one of the ten most admired women in the world after her bid for the Democratic nomination. She went back to work as a US Representative for another decade, and watched with pleasure as the number of black Congress members began to grow. After serving 14 years in Congress, Chisholm retired in 1982. She went on to teach politics and women’s studies at Mount Holyoke College in Massachusetts and co-founded the National Political Congress of Black Women. She also worked tirelessly for Jesse Jackson’s presidential campaigns in 1984 and 1988. President Bill Clinton nominated Shirley to be US Ambassador to Jamaica, but she had to decline due to her failing health. When I die, I want to be remembered as a woman who lived in the 20th century and who dared to be a catalyst of change. I don’t want to be remembered as the first black woman who went to Congress. And I don’t even want to be remembered as the first woman who happened to be black to make the bid for the presidency. I want to be remembered as a woman who fought for change in the 20th century. That’s what I want.